these our sons have been called to the order of the presbyterate. Let us reflect carefully on which ministry will be elevated in the Church. As you well know, the Lord Jesus is the only High Priest of the New Testament, but in Him also all the holy people of God have been constituted a priestly people. 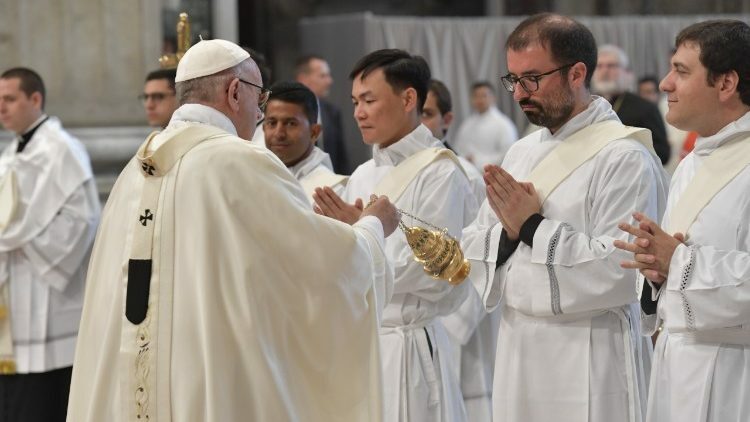 Nonetheless, among all his disciples, the Lord Jesus wants to choose some in particular, because by publicly exercising in the Church in his name the priestly office in favor of all men, they should continue his personal mission as teacher, priest and pastor. In fact, for this He had been sent by the Father, so he sent in turn the Apostles and then the Bishops and their successors to the world, to whom the priests were finally given as co-workers, who, united to them in the priestly ministry , are called to the service of the People of God. After mature reflection, we are now going to elevate our brothers to the order of priests, because in the service of Christ, Teacher, Priest, Pastor, they will cooperate in building up the Body of Christ which is the Church of God's People and Holy Temple of the Spirit. In fact, they will be configured to Christ the Supreme and Eternal Priest, or they will be consecrated as true priests of the New Testament, and in this title, which unites them in the priesthood to their Bishop, they will be preachers of the Gospel, Shepherds of the People of God, and will preside over the actions of worship, especially in the celebration of the Lord's sacrifice. As for you, beloved sons and brothers, who are about to be promoted to the presbyterate order, consider that by exercising the ministry of the Sacred Doctrine you will be participants in the mission of Christ, the only Master. Dispense to all that Word of God, which you yourselves have received with joy. Read and meditate assiduously on the Word of the Lord to believe what you have read, to teach what you have learned in faith, to live what you have taught. May the nourishment of your life be nourishment to the People of God your doctrine, joy and support to the faithful of Christ. And that with the word and example you can build the House of God which is the Church. You will continue the sanctifying work of Christ. Through your ministry, the spiritual sacrifice of the faithful is made perfect, because it is joined to the sacrifice of Christ, which for your hands, in the name of the whole Church, is offered bloodlessly on the altar in the celebration of the Holy Mysteries. Recognize therefore what you do. Imitate what you celebrate because by participating in the mystery of the Lord's death and resurrection, bring the death of Christ into your members and walk with Him in newness of life. With Baptism you will gather new believers to the People of God. With the Sacrament of Penance you will put your sins back in the name of Christ and of the Church. And here I stop to ask you: please, do not get tired of being merciful. Think of your sins, your miseries that Jesus forgives. Be merciful. With holy oil you will give relief to the sick. Celebrating the sacred rites and raising the prayer of praise and supplication during the various hours of the day, you will make a voice of the People of God and of all humanity. Conscious of having been chosen among men and constituted in their favor to await the things of God, exercise in Christ's sincere joy and sincerity the work of the priestly, solely intent on pleasing God and not to yourselves or to men, for other interests . Only the service to God, for the good of the holy faithful people of God. Finally, participating in the mission of Christ, Head and Pastor, in filial communion with your Bishop, commit yourselves to uniting the faithful into one family to lead them to God Father through Christ in the Holy Spirit. And always have before your eyes the example of the Good Shepherd, who did not come to be served, but to serve and to seek and save what was lost.